Until now, there are customers who are still balking at the price of the iPhone X (especially now that VAT's kicked in here in the UAE; ICYMI, the 64GB iPhone X is now at Dh4,304, while 256GB will set you back Dh4,965.50, from Dh4,099 and Dh4,729 previously). Now, if you're really drooling for Apple's latest high-tech flagship but don't want to spend that much (or don't like the idea of getting a 7 or 8), we have a suggestion: wait for September, AKA the start of 'New iPhone Season'. Ming Chi Kuo, the venerable and spot-on tech tipster, recently doled out the latest on what would be the next iPhones. And since we started this whole thing with an economical note, we'll be putting price front and centre here. In terms of pricing, those on a 'budget' will be happy to know that we can expect an iPhone that is in the $700-$800 range (Dh2,571-Dh2,938, plus VAT, of course), lower than the prices of the iPhone 8 and 8 Plus. Those prices, however, are up from Kuo's previous estimate of $649-$749. 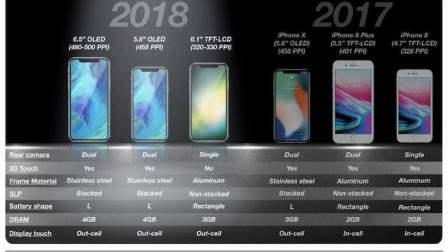 And if you're wondering why this is so, it's because the rumoured iPhone is basically a stripped-down version of the iPhone X; though it would retain some of the X's features - such as Face ID - Kuo's report, according to MacRumors, says that it would have a number of lower specs such as an LCD display with 320-330ppi (compared to the X's OLED and 458ppi), a single-lens camera and no 3D Touch. "Two new OLED models target high-end market; new TFT-LCD model aims at low-end & midrange markets: We believe the major hardware difference in the two new OLED models is size, in a bid to satisfy various needs of the high-end market. The new TFT-LCD model will differ significantly from the OLED models in hardware and design specs (for instance, the PPI will be lower). The primary selling points of the TFT-LCD model may be the innovative user experience of an integrated full-screen design and 3D sensing with a lower price tag (we expect it will likely be US$649-749)." It's also unclear whether the 6.1-inch iPhone will have a glass or aluminium back; if it comes with the latter, then wireless charging is out. And, of course, that's only one of it; as we all know by now, we can expect three iPhones to launch later this year. The second iPhone in 2018 - which we can consider to be the direct successor to the iPhone X - will come with essentially the same stuff such as a 5.8-inch screen, 458ppi and dual-lens camera. The third one is for those who love really big smartphones: it is said to have a big 6.5-inch OLED dislay ('iPhone X Plus'? ), 480-500ppi and other higher-end stuff we should expect from the next-gen iPhone X, such as an improved battery and better cameras (how about four lenses, huh Apple?). So, basically, we're staring at an updated iPhone X plus a bigger and smaller brother with it. Most importantly, you won't have to go broke (or sell your kidneys) in order to cop the latest iPhone when it comes. These will join the current roster of monkey, robot, cat, dog, alien, fox, pig, panda, rabbit, chicken, unicorn and, everyone's favourite, poop. Game of Thrones actress Emilia Clarke already shared her favourite among the new Animoji on her Instagram account... and why are we not surprised that Daenerys chose the dragon?